There is more than one way to create comfort. One way involves lots of calories and icing. This won't work if you live in the tropics, but if you are in rural Massachusetts where I started my day at 10 degrees Fahrenheit - this will work! A fantastic way to get the comfort you need is with a delicious soup. Most soups will only set you back about 100 calories for a cup and they are incredibly nutritious. Stay away from the cream soups (if you are watching your weight). Homemade soup is the BEST. Yes, I am an advocate for homemade soup because it is ridiculously easy to make and it tastes better than the packaged kind. It is also inexpensive and you can keep your sodium levels under control. BUT, I know there are some great packaged soups out there. True confession: I never buy packaged soups so I have no idea what to recommend (please help in comment section). I make my own soup, and I do it often. Today, in fact, I will churn out my favorite chicken noodle soup which will make the house smell wonderful. It is my Martha Stewart moment of perfection in a world of dirty socks on the floor. Below, I have shared my recipe that I have used 100's of times. The key to this recipe is that I make my own chicken stock. Why? Because it tastes SO much better than packaged stock (and I save money). I use a chicken for both making the stock AND the soup. Basically, I simmer the chicken for 40 minutes to cook it, store it in the fridge, and then take the meat of the bones and add it to the soup. 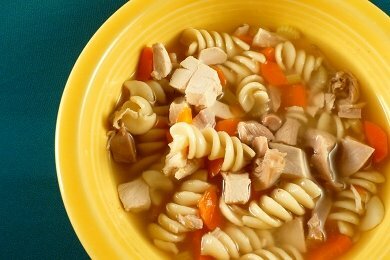 This chicken soup recipe takes two days and is much more intense then the usual Snack Girl recipes. Trust me, it is worth the work. The recipe below has a lot of pasta because I have children who love pasta. A serving size is going to vary a bit - but I would say between 1 1/2 to 2 cups of soup. Combine all ingredients in stock pot and add water. Bring to a boil, and then adjust heat so that the mixture sends up a few bubbles at a time. Cook until the chicken is done (about 40 minutes). Strain into a large bowl and press on vegetables to get out as much stock. Refrigerate overnight so that you can remove the fat which will harden at the surface of the liquid. Remove fat from surface of stock with a spoon. Cut chicken meat off the carcass and chop. Pour stock into large, deep saucepan or casserole and bring to a boil. Adjust heat so that the stock simmers. Add the pasta, carrot, celery and cook until tender (about 20 minutes). Add cooked chicken and adjust seasonings. I usually add a lot of salt at this step because I find the soup at this point to be pretty bland. Today, Snack Girl is happy to host a guest post from Everyday Maven with a recipe for slow cooker chicken curry. Yum! Ahhh, Soup. there are so many ways to go here. This method is great as it stands but it can also be a starting point for other soups. I usually make a large batch of stock using 2 or 3 chickens and cooking the stock until it reduces by one-third. The next day I skim the fat and freeze the stock in plastic containers.I pick the chickens and freeze the meat. At that point fresh soup is only minutes away on a busy weeknight.I always cook the rice or pasta separately and add it just before serving. That prevents leftover "bloat". This way you have homemade stock for other recipes. I couldn't agree with you more! I love soup!! I love it so much I always make a big batch of it every week, so I have it for lunches throughout the week, plus it freezes well. Your soup sounds delish!! I also love soup, and am a lifetime member of weightwatchers, but since you asked for suggestions on a store bought one. Campbells just came out with a new soup - the cans are larger than regular size, and the one I like is a Butternut squash bisque. It is 3 WW pointsplus for one cup (serving size on can). I also love homemade, but this one is very good. I love your site!!! LOVE soup - my current obsession is homemade egg drop soup, which is very low cal, high on flavor and works in some protein with the egg. Yum! Funny I just threw someone chicken, stock, navy beans, fire roasted tomatoes,frozen chopped onions and diced green chilies in the crock pot for dinner as I don't feel well and thought this might help. Will just shred the chicken when done. Your recipe sounds so good. Will have to try yours. I just tried the Campbell's Butternut squash bisque for the first time yesterday and it was delicious! I usually go for Progressive soups, but that one sounded great. I made my own soup for the first time just a week ago. I just used frozen veggies and low sodium chicken broth though. I added leftover chicken and couscous. It was pretty tasty for quick and easy. Not quite Martha Stewart however. Just made minestrone soup with vegetable stock chopped tomato garlic canned green beans white beans and carrots frozen spinach and some leftover tomato sauce that needed to be used up. I seasoned it to my liking with some hot salsa that gave it a nice kick. I made this soup on Monday and still have plenty left. I like the Progresso Light soups. I made chicken soup Monday night from scratch then added a can of Progresso Light chicken. It didn't make it unhealthy and it added some nice flavors. Great timing! I woke up thinking it was a day to make soup! One way to get the "creaminess" factor in a soup w/o cream is to puree. Either some of the veggies, or the whole thing. On the menu for me today is squash soup. Soup.... Yum, we must all of had the same feelings this week. Sunday night I threw together a pot of Vegetable soup, Italian style frozen vegetables, can of italian diced tomatoes, garlic, ground pepper, Vegetable stock, and some basil & oregano... It smelled so good at 9:30 p.m.my family came down stairs thinking I was cooking a gourmet meal, and I said back away, it's my soup for the week. LOL. I so love this website and have shared with many of my friends, especially WW members!! Keep em coming!! If you are looking for a nutritious commercially made soup that is lighter on sodium, try Amy's Organic soups that are "Light in Sodium". I recently tried the Lentil Vegetable which was quite good (I added pepper, could even add some Tobasco. I try to eat low sodium as much as possible, and these have been the lowest in sodium that I have found...now if you are not used to eating things lower in sodium it is definitely an adjustment. We develop a tolerance level for salt...the more you use, the more you need to use to taste it. So if you cut down, do so slowly...otherwise you will think everything is bland! Soup! ah! I think I love the smell of my house just as much as I love the taste of the soup!!! I make mine as you do! Can't beat it. I do have problems with whatever pasta I add sucking up the liquid. Any suggestions? If you simmer the bones for an hour or so, with salt and a bit of vinegar in the water, it will add calcium to your broth. In winter I always have some of my soup in individual portions in the freezer. I have started heating it in the oven or toaster oven instead of the microwave, and the meat stays more tender. I'm not going to lie - I hate soup. Don't find it comforting at all, just drippy and unappetizing. Fortunately, there are lots of warm, comforting alternatives to fatty comfort food. One that springs to mind is tea, herbal or not. Fragrant, warming, and zero calories if you don't use sweetener or maybe add a touch of stevia if you can't do without it. Plus, being hot, it makes you feel like you've eaten something even if you haven't. For comfort food that's actually food, baked potatoes are nice, with broccoli and a touch of low-fat cheddar cheese and without too much butter or sour cream. Not too hard to do that on Weight Watchers. Hi Lisa! Such a good reminder. I love putting a little bit of noodles in a big bowl of soup - great way to satisfy that craving! I love making homemade soup! I make my stock almost the same but simmer the bones for hours. I use quinoa instead of pasta or noodles for myself, but hubs and dear ol dad require the noodles! Just made some last night with homemade stock, added in 2 parsnips,fresh spinach and a sprig or 2 of rosemary and it transformed it into a much heartier soup. I make my chicken stock the same way, except I use basil instead of thyme. Since I have thyme growing outside & in my greenhouse right now, I'm going to try it your way! I made chicken soup last night, but added some cheese tortellini, a can of no-salt added tomatoes, a can of rinsed black beans & a couple of kinds of frozen veggie mixes. Yum! I have enough to share with an elderly friend whose DH passed away recently, too! When I make chicken noodle soup I put a whole chicken (minus the organ bits) in a pot, two boxes of reduce sodium chicken broth, a chopped onion, celery and carrots and cover with water. Little bit of salt and pepper plenty of poultry seasoning bring to a boil and let it simmer all day. Put in the fridge pick out the bones and skin, skim off the fat and reboil with some egg noodles. Super yummy.